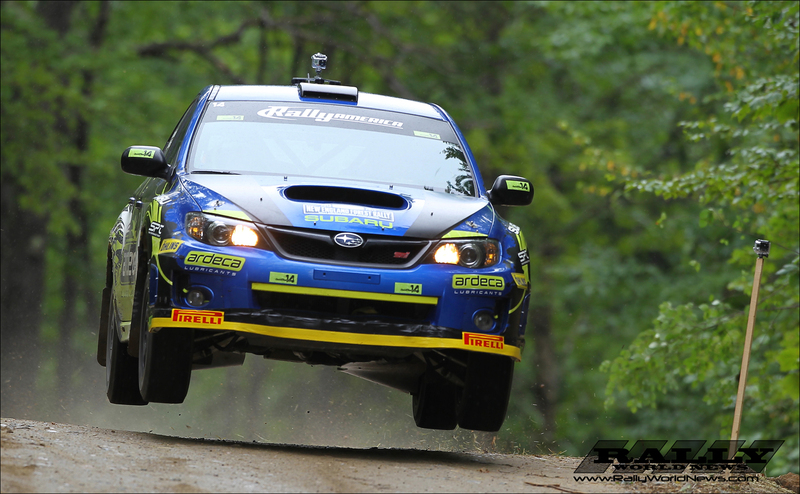 Newry, ME (July 28, 2013) --Hoonigan Racing's Ken Block and Alex Gelsomino won their first New England Forest Rally (NEFR), round 5 of the Rally America National Championship, on July 26-27th headquartered in Newry, Maine after a closely fought battle with Subaru Rally Team USA's David Higgins and Craig Drew. The margins between the two teams were incredibly thin and either could have snatched victory. Subaru Rally Team USA drove a nearly flawless event and pushed the Hoonigan camp hard all weekend, but Block and Gelsomino persevered with a 6.5 second buffer at the end. Block and Gelsomino's NEFR nearly came to an end when their Ford Fiesta H.F.H.V. experienced electrical problems on stage 11. They had no intercom communications for nearly 13 miles before the alternator quit on the transit back to service. 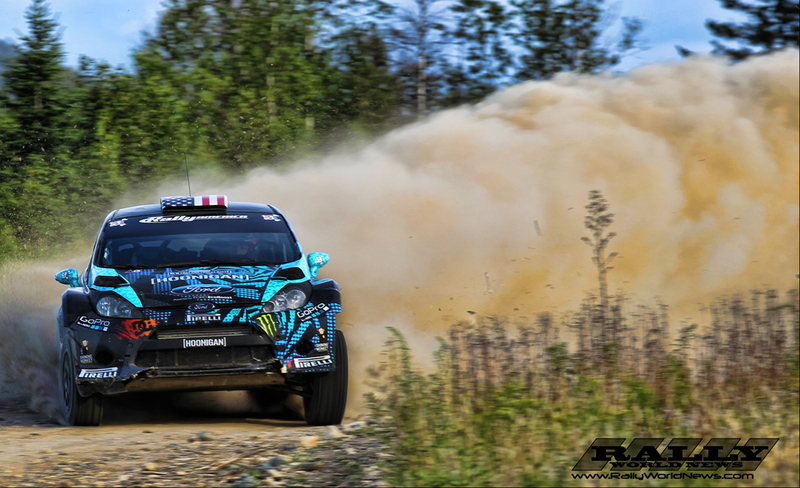 Open Class rivals Rifat Sungkar and Steve Lancaster, who were in fourth place overall at the time, graciously towed the Hoonigan Racing Team back to the service area so Hoonigan Racing Team could complete repairs and continue their race. 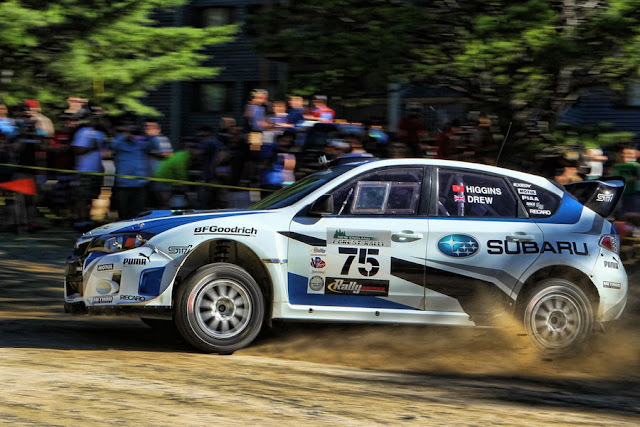 "It took a bit of good luck, it was a great battle with Subaru," said Block, "I know a couple of these stages, so I put the hammer down and built a bit of a lead. I had some small problems and then a big problem with the alternator going out. What a struggle, I put everything into it, and drove my heart out." The New England Forest Rally marks Ken Block's second consecutive Rally America National Championship victory having won the Susquehannock Trail Performance Rally last June. David Higgins currently leads the Championship Standings, but Block still has a mathematical chance at the title if he outright wins the final two rounds of the season. Rifat Sungkar and Steve Lancaster were able to climb from fourth place to third overall to complete the NEFR podium with a little luck. Over the course of the weekend Sungkar saw a few competitors ahead of him fail to finish. The Rockstar Energy Drink Rally Team of Antoine L'Estage and Nathalie Richard ultimately broke their wheel bolts on stage 11, and privateers Joseph Burke and Alex Kihurani went off on stage 6 and were unable to continue. That left Sungkar alone in third place. Notably L'Estage and Richard have won the New England Forest Rally the last three years in a Mitsubishi EVO X and looked to add their fourth overall victory to keep their streak alive. 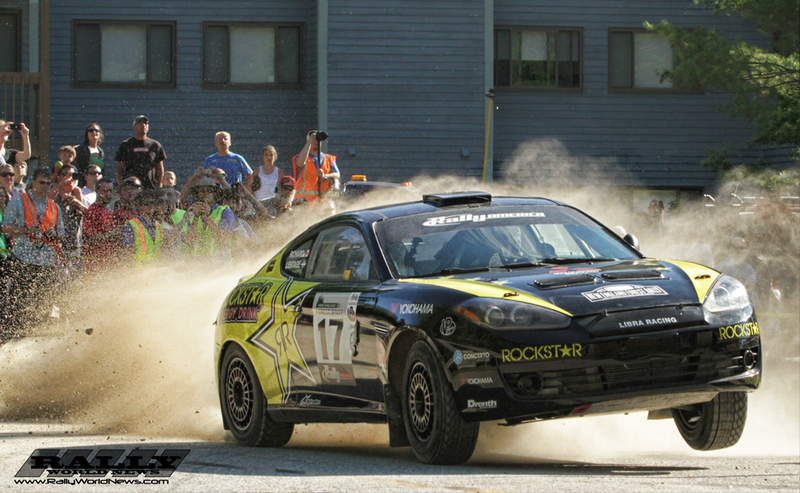 This time they competed with a Tiburon rally car that has seen plenty of rally action in the past, but the team experienced problems that effectively ended their event on the second day. In the Super Production Class, David Sterckx and Karen Jankowski notched a third consecutive class win and also placed fourth overall in the event. 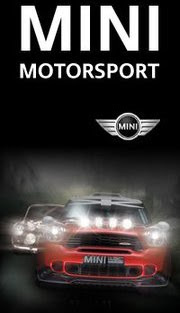 This is their fourth podium finish since failing to finish the Rally America season opener Sno*Drift Rally in January. This NEFR win extends their SP Class standings total while keeping third place in the overall Championship standings. "The New England Forest Rally was hard because of all the sharp rocks," added Sterckx, "We broke some things, but we fixed it all in service and it was good enough to win." Super Production's Mason Moyle and John Hall took second in the class after an exciting battle with Rookie of the Year contenders Nick Roberts and Nick Judkins. Over the course of the weekend Moyle lost second place to Roberts, yet later snatched the position back when Roberts suffered a strut failure on stage 11. Moyle had suspension damage as well; only he was able to carry enough speed to overtake Roberts and win by 6.1 seconds. This is Moyle's third podium finish this year and Robert's first in his rally career. The Two-Wheel Drive category was an absolute knockdown fight won when Australia's Brendan Reeves and Rhianon Smyth finally overtook fellow Australian rivals Will Orders and Toni Feaver on stage 11. Orders jumped into the lead on stage 1 and fended off Reeves until Orders overheated his brakes on the more technical stages of the event. Reeves seized this opportunity to take the lead with his Ford Fiesta R2. 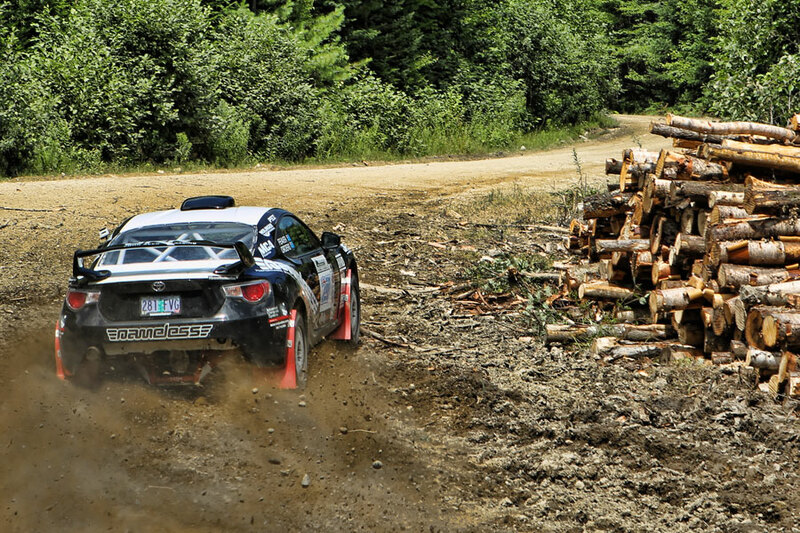 The 2WD win is Reeves and Smyth's third top podium finish since joining the Championship at the Oregon Trail Rally. 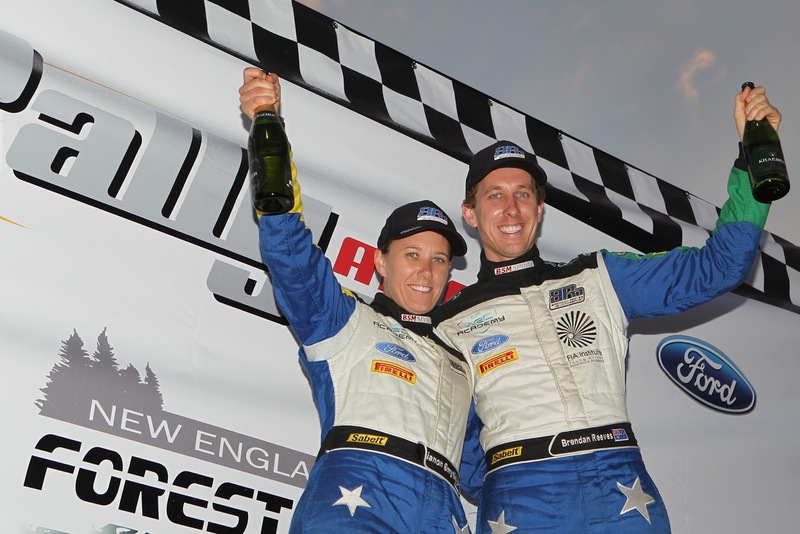 Said Reeves, "We've been driving these (Ford Fiesta R2's) for a few years, so we have the experience to win. Car is driving great, we have three wins now, next... we'll try for four." Will Orders had won the 2WD Class at the 2012 New England Forest Rally. This time he takes another podium with a newly built Nameless Performance Toyota GT86, the first of its kind in America. Current 2WD national standings leader Andrew Comrie-Picard and Jeremy Wimpey were able to preserve their points lead by taking third place in class. The team overcame early gearbox problems in their Scion xD and drove a fantastic race to come back as far down as 7th in class to the podium. Comrie-Picard and Wimpey have made the podium every event this year and just needs to keep that trend going in order to finish the season with their first 2WD national title. Team Honda Research's James Robinson and Ross Forde won Rally America's B-Spec category. Tracy Gardiner and Nigel McGinn took second place. Robinson was a one man show driving and crewing for his Honda Fit, and squeaked out the win running his Honda with a broken engine mount and limited power on the last two stages of the day. 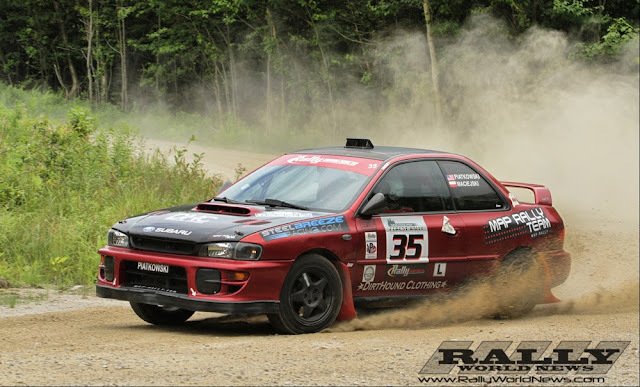 The Maine Regional Rally and the New Hampshire Regional were both won by MAP Rally Team's Mark Piatkowski and Robert Maciejski in their Open Light Class 2000 Subaru Impreza 2.5RS.